On 1/23, Razteria (Renee Asteria), Sang Matiz & Rahman Jamaal present their new singles Aventurera & Change for the first time live in concert. AVENTURERA blends South American sounds w/a flavor of reggaeton, intertwining talents of Yuriza Jared (Sang Matiz) & Razteria. We become the adventurer in the song, traveling either physically or spiritually, to grow & heal. Available for purchase on all digital platforms 1/15/16. CHANGE, contrasting artists Rahman Jamaal & Razteria, fuse on this trilingual crossover track which calls for revolutionizing our mind-state without fear. Change is the only constant in Life. Available for purchase on all digital platforms 1/22/16. San Francisco based artist Razteria (aka Renee Asteria) can be described as a fusion of Bomba Estero, early No Doubt, Steel Pulse and Marissa Monte. 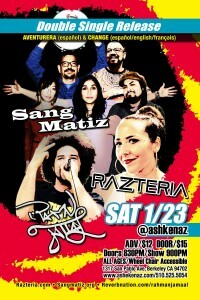 Razteria unites simple yet intricate songs w/powerful messages through ethereal harmonies, passionate grooves & fat bass. Aventurera is the title track of Razteria’s new album coming Spring 2016. Sang Matiz has been performing for 6 years, fusing World and Afro-Brazilian/Peruvian beats with contemporary rhythms such as Pop, Jazz, and Funk. Thanks to a grant awarded by The California Arts Council Endowment for the Arts and The San Francisco Arts Commission for Cultural Equity, they released the album, “Ship It!” Most recently in August 2015, they were chosen and honored to open for the legendary Cuban band Buena Vista Social Club Orchestra for their “Adios Tour.” Throughout the years, they’ve also had the great opportunity to collaborate with various renowned Bay Area musicians such as: Jackeline Rago (Master Percussionist), Miguelito Martinez (Flutist/Composer), Silvestre Martinez (Composer/Percussionist), and Grammy Award-winner Braulio Barrera (Pacific Mambo Orchestra), among many others. In addition, they’ve had the pleasure of sharing the stage with national and international acts such as Jorge Santana (Malo) and Pete Escovedo. Rahman Jamaal is a performing artist, emcee, musician, actor, and educator who first debuted in the 2003 Sundance Film Festival as the star of the movie “The Beat”. He is highly active in the Bay Area as the founder of Rap Force Academy, and the nationally as the Executive Director of Hip Hop Congress. In 2014, he won the Lennon Award for Hip Hop in the International John Lennon Songwriting Contest (JLSC). Raynice Gomillion known to her fans as the lovely and dynamic Irae Divine was born in Jersey City, New Jersey. Growing up in Philadelphia within a musically rich family environment, she began singing at an early age. Irae’s thirst to sing and perform took her to church, plays and talent shows. Involvement with an R&B band eventually leads Irae to the heartfelt pulse of Reggae Music. Born and raised in Iran to an Armenian mother and Jewish father, Amanda aka Sol Atash has been referred to as “the walking United Nations” since a young age. Sol meaning sun in Spanish and Atash translating to Fire in Farsi (the language of Iran), Sol Atash embodies Sun Fire -a Farsi speaking fiery Sagittarius. Sol was encouraged to sing in 2011 by an artist with whom she was working. She sings Reggae music in Farsi, very rare indeed.